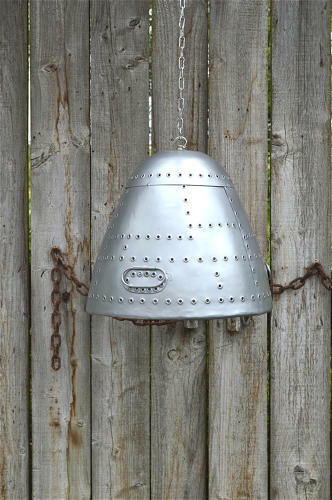 A super cool vintage aircraft nose cone light. Made from hand riveted steel with a flat silver finish. The look of these is vintage so they are designed to have small dents, ripples to the surface and imperfections. We have made these as an experimental batch and only have a few available. They come supplied with a hanging chain and British made B22 bulb holder with built in earth and hook. Please note the cable is not supplied but we have a full range for sale in our shop. The light measures 38.2cms diameter and 33.5cms tall without the hook. 15 inches diameter and 13 1/4 inches tall.